Tournament Memories in England – 1999 World Cup finalists, 2004 Champions Trophy semi finalists and 2009 World T20 winners. Tournament Success in ICC events since 2007 World T20 – 8 out of 9 ICC men’s events they have reached the semi final. The only exception was the 2012 U19 World Cup quarter final where they were defeated by their neighbours by only 1 wicket. They rise to the occasion and turn it on. Preparation - Arriving in the UK 3 week before the tournament and playing matches against 2 of the stronger associates prior to the championship getting under way. Form Guide – Since last ODI ICC senior team tournament they have won 9 series, lost 4 and won an Asia Cup title. 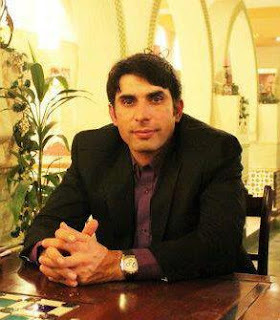 Misbah has won 27 ODIs as captain and only lost the 15 including series wins against Sri Lanka, India and Bangladesh. Familiar Foes in Same Group – They have played West Indies, India and South Africa in away bilateral series since the last World Cup and have won two of them with the series defeat against the Proteas going down to a decider with the series poised at 2-2. Support in UK – There is a strong Pakistan contingent in the stands for one day games in the UK and this tournament will be no exception to the rule with tickets for Pakistan’s games gone thick and fast. This can only help the players and inspire them to give something back. Overcoming the semi final jinx is bound to occur with Pakistan’s inability to win knock out games at world events. If they keep putting themselves in such positions, they are going to be rewarded sooner than later. Under a mentally tough leader, they stand every chance of getting over this hurdle. However, in 50 over cricket Misbah is more versatile, busy at the crease, has a stronger record and has a wider range of strokes in his repertoire than those mentioned while being able to hold the innings together and keep his wicket at the same time. He is the best of the lot at playing the holding role, without being overly cautious and having the ability to show a different side to his game as well. Azhar Ali and Asad Shafiq are both automatic starters in the test XI and the best young-ish batsmen to have emerged from Pakistan in the last decade in terms of their long format credentials where ultimately you judge the metal and quality of an individual player in the premier form of the game. Both have been permanent members of the side who have consistently made strong scores and played lengthy innings, often in challenging situations. Temperamentally Misbah and Azhar are stronger than Asad and Younis. Technically Younis and Azhar are better equipped than Misbah and Asad. In terms of grace and elegance, Asad tops the list. In terms of best all-round record and proven credentials across the 3 different formats, Misbah stands out. All are very capable fielders and catchers. Younis and Misbah both captained Pakistan, although Misbah has achieved much more as captain and has captained for significantly longer and generally was undoubtedly the better in terms of results, stability, intellect, individual form, well roundedness. Azhar and Asad have both been regarded as potential future leaders with areas of captaincy material in them. Let Hafeez captain in 20 test matches in a wide range of conditions and 30 ODIs before saying he is a better captain than Misbah. You don’t become a top captain through Twenty20. Some newspaper experts are putting polls up about the better captain. Ill-logical. Hafeez might end up as a capable international captain, but he will have to captain out of his skins to match Misbah’s achievements which are vast, both in cleaning the culture of the team in deep adversity and leading his side to series wins, one after the other against some difficult preposition such as England, Sri Lanka and India in different forms of the great game. Misbah Factor (Mr Dependable) – Highly rated by those who have worked with him and know him well in terms of being an articulate and smart man in the game, well respected by team members and coaching staff, statistically high achieving. Those in the cricketing circles such as fellow players or top class journalists think highly of him and his man management credentials are most impressive. We have already seen him win tournament silverware as captain, though not in an ICC event. One of Pakistan’s finest and most stable in the captaincy department. Misbah was also vice captain of the 2009 ICC World T20 winning side and 2011 World Cup semi final campaign so has the experience in leadership/seniority in positions at ICC events somewhat. 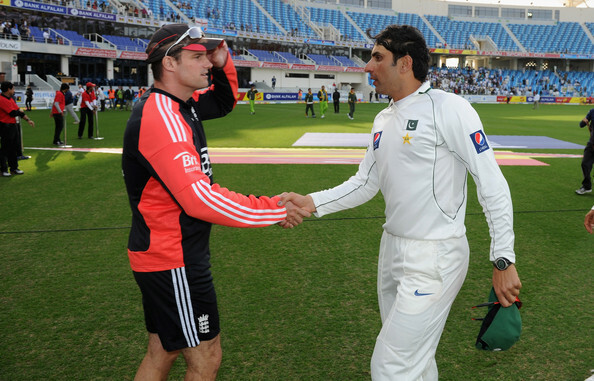 At one stage Misbah’s international captaincy record read only 2 defeats in 35 internationals on 10th February 2012 after the conclusion of the first ever official one day international between Pakistan and Afghanistan in Sharjah. For a side that are known to struggle with stability, continuity, specialism and intellect in national captains since Imran, Misbah is as good as they come by Pakistani standards. Finally, the Greens have an honest, educated, trouble free, diplomatically spoken, consistently performing, dependable, assuring, respected, naturally identified, calm, unflustered, mentally tough, disciplined leader who needs to be encouraged to stay in the job as the team could really do with making best use of his unique services. Without exaggerating, he is a rare species in terms of leadership, personality and background in what has been a tainted culture of scandal. I wanted him leading for the event, but wasn't 100% sure he would have been due to the potential incompetence of the board. However, brains have prevailed. It was only fitting that Pakistan’s most influential leader in handling adversity and changing the dynamics of the side since Imran gets the chance to join him as a 39 year old ODI ICC tournament winning skipper. Who could put it beyond him with his determined self belief to surprise the lot and win over his critics who have been calling for his head for over 2 and a half years? There are certain leaders who were born to lead, Misbah has always been one regarded as a natural in the art. Misbah rises to the occasion in world tournaments as a batter as the below evidence illustrates. The team will need him to perform individually as the batting relies and depends so heavily on him to create a sense of calming influence, stabilising presence and perspective minded wisdom out in the middle. The captain is very handy to have in low scoring games and when chasing modest targets, is renowned for closing out games and is tailor made for operating in a crisis. He also, knows how to reassess a total with the conditions in mind accordingly and anchor the innings by occupying the crease for the bulk of the overs, working his way to a score and preserving wickets. He keeps the side together as a unified outfit, avoid off field troubles from emerging, speaks professionally and comes across as a thorough professional in the field who is a highly suitable ambassador for both game and country. He has a strong temperament and is mentally a tough nut which often forms a capable leader of men. On the field tactically, his ability to read conditions, his ability to extract the best out of his troops, his pre-match planning, his eye for talent such as spotting Ajmal and giving chances to Asad Shafiq and Junaid Khan in the test side and his intense desire to pride the team with qualities of control, cunningness and consistency stand out. Individually, he trains hard, is known to be responsible, performs well which always helps, possesses deep game awareness, ensures he keeps his fitness in shape which aids him in setting the example both through form, game plans and work ethic. For as long as he remains in the job, the national cricket side is in safe company. He has been the central figure who has been there throughout in the side’s road to redemption since 2010, let it be as vice captain or captain of the one day side and captain of the test side with a brief stint as T20 captain too. The team certainly play a disciplined, relentless, patient, focussed brand of play under him with moments of typical green shirts magic in between. Even after he packs his bags, you be sure he will still be involved in the game in one way or another and already has done punditry for Ten Sports alongside Danny Morrison and Waqar Younis at the 2012 ICC World T20 where he impressed many. 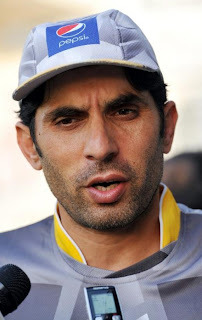 Misbah ul Haq will captain the green shirts in the ICC Champions Trophy in England in June. Pakistan have never won an ICC Champions Trophy. Pakistan have never played an ICC Champions Trophy final. Zaka Ashraf assured Misbah of retaining captaincy for the showpiece event. Misbah will be 39 when the tournament is in progress which was the same age of Imran Khan when he won the 1992 World Cup, the only ICC ODI senior team tournament Pakistan have won. Before, the ICC Champions Trophy, Misbah will lead Pakistan in matches against Scotland and Ireland in 2 match series in May. Misbah was Pakistan’s leading ODI run scorer against South Africa with 227 runs in the series at an average of 57. Misbah has been Pakistan’s 2nd leading ODI run scorer since 2011 at an average in excess of 40 with 11 half centuries contributing in winning causes. Misbah is Pakistan’s 6th most capped international leader out of 33 national captains across the different formats and is number 6 in most wins too, only bettered by the big 5 of Imran, Wasim, Inzamam, Miandad and Waqar. Can Misbah lead Pakistan to Champions Trophy glory after winning the Asia Cup last year? Root loves a dig in, being one of Boycott’s pupils at Yorkshire. Expect him to relish the challenge and enjoy the game situation. How long more can Bell be slow, long and boring? He has a strong enough defence to bat time. I fear he might do something uncalled for. KP would have been useful in this context, too. Would have taken them on, removed the attacking fielders and given bowlers something else to consider. 70% New Zealand win, 30% draw. More often than not you will lose with only 6 wickets to defend on a day 5 wicket. Assuming the inevitable occurs, NZ have only lost 1 of their last 8 at home. Misbah’s drought breaking series win here was quietly dismissed. And that, came against a stronger more experienced attack with Martin and Vettori both available. Pakistan will play an ICC Champions Trophy warm up match prior to the tournament kicking off. Edgbaston will be the venue. County season is in full swing by the time the warm up matches are in progress so the match will be against an international opposition. Prior to the 2004 ICC Champions Trophy in England, Pakistan played Australia on the first Saturday of September in a 1 off 1 day international. On this day 21 years ago Imran Khan led his country to World Cup Glory. I have been against the inclusion of Younis, Malik, Kamran, and Afridi in ODI team and they are the ones who have come under the scanner again. Kamran Akmal may have scored 40 odd in the last game of the series, but so did Safraz in the harder form of the game. It is nothing to smile about or to justify his selection for the next series. Pakistan need a better wicket keeper and an honest one who does not have past connections with Mazhar Majeed as Pakistan’s security manager on 2010 tour of England reported. Imran Khan was 39 when he won the World Cup. Misbah ul Haq will be 39 when he will lead in the Champions Trophy in 2 months. Old horses. Old is gold. That was completely unexpected. New Zealand without Chris Martin and Daniel Vettori and a side with a new-ish captain and coach are trouncing England. England were red hot favourites to take the series 3-0. The Kiwis are weaker than they have been for a couple of decades on paper, at least in the premier form of the game. Only Bangladesh and Zimbabwe are weaker currently when it comes to the red ball contests. Instead, England lost the 4 day warm up match defending over 300 in the 4th innings in Queenstown, have lost one of the best spinners in the world through a serious injury concern and have comprehensively been outplayed on the opening day of the series with New Zealand approaching parity with 2 well-set batsmen on 50s and 10 wickets in tact having bowled out England in 55 overs earlier in the day at the University Oval. This is even more remarkable than Pakistan dominating in the UAE and England winning in India with issues in the dressing room coming into the series and after heavy defeats in the UAE and Sri Lanka against spin in the same year raising many doubts about England's ability to counter spin or turning surfaces. It was only a few months ago when it was being said that New Zealand Cricket was rapidly falling away and were at their lowest point imaginable. Surely England will bounce back, however for New Zealand to win a test against them will be monumental for both them and the cricketing world in a series that was expected to be heavily one sided. New Zealand are on track to build a match winning lead assuming they don't have a dramatic collapse. England are on the back-foot and will have to play out of their skins to avoid a defeat here. New Zealand have easily won each of the 3 sessions on day 2. This test match is an effective trial for the case of pushing for 4 day tests and getting the over-rate up in order to achieve it. However, that can only work in certain parts of the world where the action is more eventful in terms of wicket-taking and where the light is good enough for a full day's play to get enough RESULTS. But with day night test matches now permitted assuming the boards agree, perhaps we could see more of it and it is a more realistic initiative.